Nevada Road Map Guides might be one place to take a virtual tour on Nevada highways to help you plan a trip. Some sections are mile by mile descriptions with photographs. 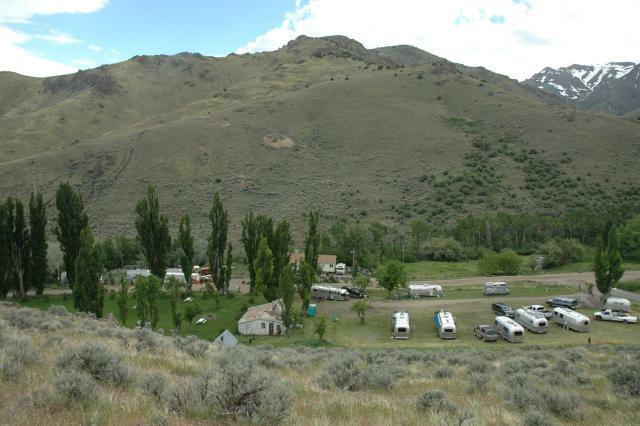 There are lists to help you find campgrounds and RV parks. Seems a bit rough but might be worth a perusal. ANN ARBOR, Mich. – Thetford is introducing a new sanitizing solution that kills 99 percent of the bacteria found in RV fresh water plumbing without using seal-damaging bleach or chlorine. Fresh Water Tank Sanitizer destroys bacteria such as staphylococcus aureus (staph), eschericia coli (e-coli), listeria and other microorganisms in 60 seconds or less. It also does not have the unpleasant smell and taste associated with chlorine- or bleach-based additives. Most RV enthusiasts don’t realize that water tank surfaces and systems must be sanitized to prevent disease. It’s the first and only product available for use in tanks, lines and hoses to be registered with the U.S. Environmental Protection Agency in all 50 states. Here’s the official Material Data Safety Sheet (PDF form) and the PSA. The question is why use this rather than a mild solution of hypochlorite (household bleach). Both need dillution. Both need care in handling. Both do the job. But it appears that Thetford’s new product isn’t quite as hard on the water system hardware and doesn’t tell you it is there the way bleach does. It provides an alternative for those who do not like using bleach. NASA reports on An Alignment of Stars and Planets in June 2006 to watch. Starting today, Saturn will be the focus. Right now it is near the moon on one side and the Beehive star cluster on the other. Towards the middle of June, Mars will approach Saturn and then Mercury will join the crowd. Get out the binocs’ and keep an eye on Saturn and its environs! Need a manual for a piece of equipment? Check this library. Panasonic, Motorola, Samsung, Sharp, Casio, Yamaha Audio, Funai, Icom, and Phillips are among the manufacturers whose equipment manuals are available. The May SNU Rally at Unionville, Nevada was well photographed. Here’s a rundown on the photo galleries with contributions from Don, Jerry, Randy, Bryan, and some others. See the photo gallery for the Unionville Rally. There was a renunion here a while back, too! NVDOT has been working on the local freeway supplement to I80 that follows and compliments US 395 since 1957. This is called I580, same as a similar freeway adjuct in California. The Nevada I580 will essentially provide a freeway from the California border north of Reno to south of Carson City. It is likely that it will eventually include freeway on the US 395 route all the way to the California border south of Carson City. The NVDOT has a web site about the project with fancy interactive maps and things that will give your browser plug-ins some good exercise. One of the project bridges over Galena Creek is creating some disagreements between the original contractors and the NVDOT. The RGJ story says it involves concerns about potential winds and the resulting hazards during the construction phases. This bridge is planned to be one of the largest in Nevada of its type matching that being built to bypass the Hoover Dam. It is interesting that the bypass is being strengthed in the southerly direction so large construction trucks can use it to move massive amounts of dirt from the north end to the south end with minimal impact on non construction roads. This is going to be an interesting tour when it completes in 2009 as currently planned. If you need to burn any vegetation piles left in your yard, you need to do so before the middle of next week. Open burning in the Truckee Meadows ends on Wednesday, May 31. When open burning resumes in the fall, there will be a new permitting process that includes a $50 fee. If you want more information on the open burning process, call the Reno Fire Department at 334-2300. Update: this is yet another increase in the cost of cleanup in Washoe County. First was the mandatory trash pickup. Then just recently the cost at the transfer station more than tripled. And now it will be an expensive permit to burn trash. – No wonder the desert is getting littered. There’s always the problem of how to live comfortably when off grid and out in the boonies. 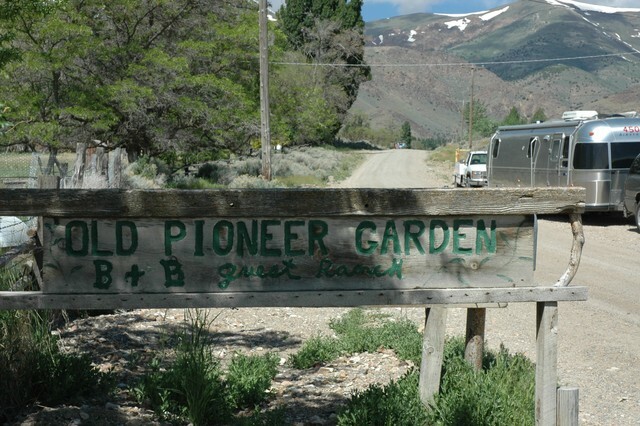 Here’s how some folks solved problems at Unionville Nevada in May 2005. See the photo gallery. Dale (Pee Wee) Schwamborn, the second cousin of Wally Byam, sends along pictures of some of the folks who put the Wally Byam Caravan Club together and made the legend of the early Airstream caravans. This picture is Del Mar, California in the 30’s Wally cooking on open fire, Henry Schwamborn sitting on the ground, Wally’s friend Bill Blitch, and Marion Byam. The Washington Times presented an AP story about how Boomers take RVs on lifetime road trip. More often than not, today’s RV enthusiasts are not the types who prefer sipping beer in front of the campfire, roughing it in communal showers in lieu of a 9-to-5 job. Now it’s all about luxury, said Bob Livingston, editor for Trailer Life magazine. The typical RV owner is age 35 to 54, owns a home, has an annual income of $68,000 and travels an average 4,500 miles a year, the study said. This goes back to the Walker River rally insight that you no longer find north by looking for moss on trees. You find southeast by looking for where the satellite antennas are pointed. Many long term to full time RV enthusiasts are taking their jobs with them by utilizing modern communications and even ‘home’ schooling for their children. History lessons? Visit the site. Geology? Let’s go see an example. It puts a whole new meaning to the idea of field trip and family togetherness. 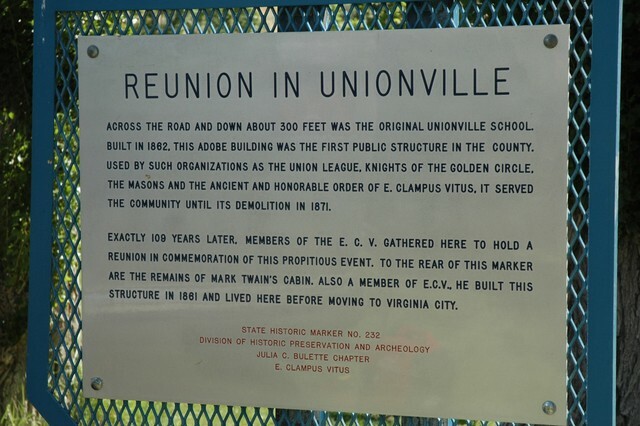 Unionville is spread out up Buena Vista canyon. Between the hills on each side there is just room for the creek and a road and an occasional place to put a house and yard. As you go up the canyon, the places to put a house become more rare. Farther still and room for the road gets rather tight, too. Here is the SNU rally at a county park carved out of one of the wider spots midway up the canyon. Here, the plan from south to north is hill, creek, house, road, park, hill. Even then the park had quite a slope to it. A gallery is planned to show what people did to get their trailers level. Lots more pictures for later! This is a picture Don Damoth took after a hike up the hills on the north side of the canyon. This particular park is about as far up the canyon as you can take an RV. Unless you know where you are going, the search is one of heading up the canyon road as it gets smaller … and smaller … and you wonder if you might have passed it somehow and if you are going to get too far up the road and not be able to turn around. There is a turnaround, sort of, after the last house. eG Forums has a good explanation about how to maintain and sharpen your knife. The focus is on kitchen knives. It starts with the sad truth about kitchen knives. Then matters of steel, the edge, and sharpening are discussed. Finally is a rundown on maintenance and an overview of sharpening systems. At the end are several resources. There are a lot of good pictures and diagrams, too. A knife is one of those basic tools. Here is a good resource to find out how to make sure your get the most of yours whether in the kitchen or elsewhere. While limits ranged from 75 mph to 55 and back again, no significant increase in fatalities per mile driven are evident. In fact, from 1968 to 1991, the fatality rate per 100 million miles declined by 63.2 percent. Speed is a significant distraction in the vehicle safety debate. The problem is that speed is related to the damage that occurs in a crash but does not necessarily serve as the cause of the crash. People tend to drive at a safe speed and do not tend to pay attention to speed limit signs unless they are afraid of being caught. This means that the vast majority of folks driving on the open freeway are driving safely even if they aren’t driving at a speed that pleases you. Crashes don’t occur due to the speed they are driving but rather to drowsiness (see distracted driving is dangerous) or other failure to pay attention to the job at hand. Equipment malfunction is a cause but it is really rather rare these days. You might also check out their report on The Science of Traffic Jams. Crowded highways with changing speeds is a recipe for unpleasant circumstances. This report provides some advice on how to avoid those circumstances. The key is to be alert, watch the traffic well ahead so you can anticipate needed action, try to allow plenty of room, and don’t get caught by surprise. Drive safe! Pay attention to the primary job at hand. KTVN notes several stories of interest to those who get out and about in the Sierra Nevada airstreams. That the wet late winter is likely to produce a bumper crop of mosquitos and no-see-ums like the Walker river black flies. This can be a concern for the spread of West Nile Disease as well as an obnoxious nuisance when trying to get a restful weekend out with your RV. Washoe County is taking the lead in using sentinal flocks of chickens to provide early detection of mosquito born (vector) disease. The Spring Wings Bird Festival at Stillwater National Wildlife Refuge near Fallon was the occasion to open a new 15 foot high observation platform. Now we need scouts to find a good weekend rally spot out there so we can have a Stillwater SNU rally and visit the new observation platform. There is going to benew $6 million museum in Donner Lake Memorial State Park near Truckee. In mid June the site will be subject to an archeologic dig, one of several in the area to uncover artifacts about the California emmigration. Boca Springs, the site of the June SNU rally is one of those places that was examined. Current practice is to carefully mark and catalog everything found and then put the area back to just how it was, complete with artifacts, so later investigators will be able to do the same thing but perhaps with better tools. Water hoses are a pain, how about a flat one? Storing hoses in your RV can be a problem. You have water supply hoses, drain hoses, and a cleanout hose to put somewhere. How long should your be? Where do you store them so drips don’t cause problems? How do you keep them clean, sanitary if a supply hose, and neatly packaged for storage? First is to learn a bit about hoses. You need to be able to tell if you get one intended for the purpose – especially look for drinking water safe if needed. Second is to look for one that has convenient storage in mind. Think about lengths and how you can join hoses if necessary for extra length. Also consider whether you need one that is going to be used just for filling the tank or for longer term city water hookup. 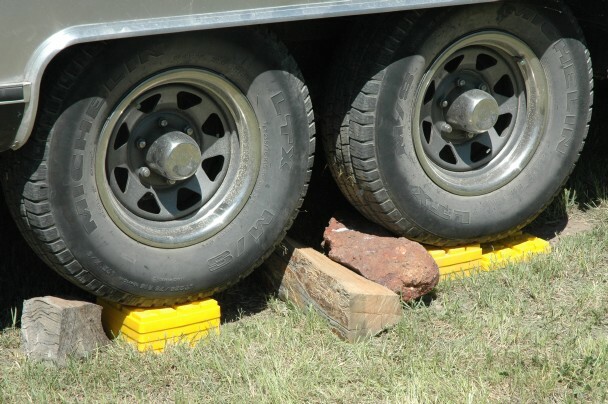 Hoses that flatten for storage are very convenient for RV uses, especially for tank fills. You should probably also have a hose that is a bit more rugged and somewhat shorter for longer term pressure hookups. The one you use for flushing and gray water doesn’t need to be drinking water safe but probably needs to emphasize inside diameter (low pressure flow). Here are some good articles about water hoses. Popular Mechanics – Garden Hoses – identifies ten different types of hoses. All About Garden Hose gets a bit into flow, cracking and the most common hose types for the garden. Flat Water Hose Tips and Ideas – how to hook up a hose to an RV water fill so you don’t mistreat the hose. komo news | Buyer Beware : Flat Hoses — Do They Work? – the ugly side. Yes flat hoses can be a knotted rope when not full of water. Here are some sources for flat hoses. On a rally with water supplied, you will need a Y connector with no valves (to allow most water through), and at least a couple of 25′ hoses of at 5/8″ interior diameter. A ‘water thief‘ is also a good idea if your outing is at a camping area with faucets intended to discourage permanent hose hookups. The Unionville rally planned for the weekend of May 18 is going to be a dry camp and a good chance to make sure you did your Spring maintenance and prep job right. KNPB’s Wild Nevada show also visited the site. They mention some of the other ghost towns in the area. Before heading out it might be a good idea to check the weather underground for Unionville weather conditions and forecast. Be sure to send in those RSVP’s if you are going to attend the special rally brunch at Mitzi’s.